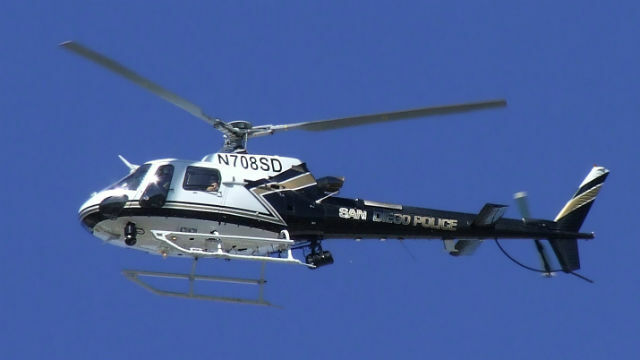 A 32-year-old man was in custody Wednesday on suspicion of pointing a laser at a San Diego Police Department helicopter in the Mission Bay area. The helicopter was flying in the area of Fiesta Island around 10:30 p.m. Tuesday when someone on the ground began pointing a purple laser at the aircraft, Officer Tony Martinez said. The helicopter crew was able to find and track the car where the laser was coming from, and patrol officers on the ground stopped the vehicle. Inside the black Volkswagen sedan, officers detained and questioned 32- year-old Robert Louis Silva Jr., who was then arrested and booked into jail on suspicion of a felony count of discharging a laser at an aircraft. He was being held Wednesday morning at the San Diego Central Jail in lieu of $25,000 bail. The crime Silva is suspected of committing can be charged in California as a misdemeanor or a felony. As a felony, it carries a potential penalty of 16 months to three years of imprisonment and up to a $2,000 fine. Last December, 27-year-old Chula Vista resident Michael Angelo Ramirez pleaded guilty in U.S. District Court to shining a laser into the cockpit of a Border Patrol helicopter. Under federal law, the crime carries the potential of up to five years in prison and a fine up to $250,000. Ramirez is set to be sentenced in the case next Monday.